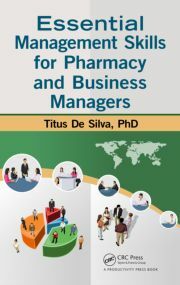 Essential Management Skills for Pharmacy and Business Managers describes how to create a harmonious environment where team work flourishes. BOCA RATON, Fla. - May 22, 2013 - PRLog -- As a manager you will be expected to resolve a range of legal, ethical, operational, human resource, and financial issues that affect your organization. Essential Management Skills for Pharmacy and Business Managers supplies the understanding you will need to manage the day-to-day challenges in this increasingly competitive environment. Presenting a wealth of information on how to resolve common issues across all sectors of the pharmacy environment, it uses case studies to illustrate the methods required to create a patient-focused business where teamwork flourishes and continuous improvement becomes a reality. The book describes the kinds of things that will most often go wrong in organizations of all types and sizes and provides proven methods for resolving these issues. It explains how to develop and implement an effective quality management system in the pharmacy or a retail operation that complies with external standards. Outlining an efficient performance appraisal system, it describes how to manage diversity and details time-tested problem solving, conflict management, and stress management techniques. With coverage that includes employee management, quality management, and quality assurance, the book describes how to create a harmonious work environment that promotes effective communication between pharmacy staff, medical professionals, care givers, patients, and customers. Complete with links to further information in each chapter, it arms you with the tools to empower and motivate your employees to provide world-class patient and customer care. A very comprehensive book that, if thoroughly read, understood, and implemented, will lead to best practice for this industry sector. ... I recommend this book as compulsory reading at least for all pharmacy and business management, professional or otherwise, but more particularly as a compressive training manual for all staff in a group environment. One clear conclusion is that the vast literature on business management can give a range of answers on important issues ... . This book puts these generic issues into the specific context of the community pharmacy and gives sound and valuable advice on how to successfully manage this type of business. Titus De Silva, PhD gained his pharmacy degree (with honors) from the University of Manchester in the United Kingdom. He has worked in the United Kingdom, New Zealand, Japan, and Kuwait in all sectors of pharmacy practice (hospital, community, academia, research, and industry) and also in the beverage industry. For over 30 years, he held senior management positions in New Zealand, the United Kingdom, and Sri Lanka. Before immigrating to New Zealand, he was the head of the National Drugs Quality Control Laboratory in Sri Lanka. During his time in Sri Lanka, he was a visiting lecturer and examiner at the Faculty of Medicine of the University of Colombo School of Pharmacy. While in Kuwait, he served as a specialist in drug analysis and quality control under its Ministry of Health. In Japan, he was attached to the National Institute of Hygienic Science in Tokyo, where he worked with experts in pharmaceutical science. Organizations he worked for include Southland Hospital Board (New Zealand), Hoechst Pharmaceuticals (New Zealand), Pernod-Ricard (New Zealand), Eli Lilly Research (UK), Ballinger’s Pharmacy (New Zealand), Boots Chemists (UK), and Lloyds Pharmacy (UK). In addition to his pharmacy qualifications, he has a BSc degree in chemistry, postgraduate diploma in computer science, and MBA and PhD in management science. He is a chartered chemist (CChem), a Fellow of the Royal Society of Chemistry (FRSC), a member of the Royal Pharmaceutical Society of Great Britain (MRPharmS), and a member of the Pharmaceutical Society of New Zealand (MPS).